One of the things I had on my list to do when Tess and I went to Boise for Thanksgiving was visit Morris Hill Cemetery and try and track down some of my relatives graves. It's part of my new obsession with discovering my roots. This is not to say that I think my roots are growing in a cemetery. But graves are an important clue in putting together any family tree. 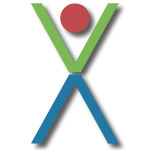 For one, they confirm dates when a relative lived. So, armed with a list I'd prepared of relatives I thought were buried in Boise, we pulled up to the office of Morris Hill Cemetary on the Friday following Thanksgiving. 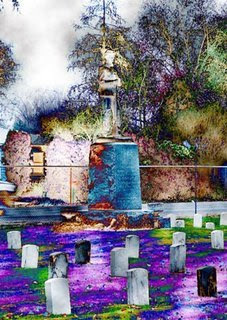 The 70-acre cemetery has been the final resting place for Boise residents since 1882. I remember going for walks there when I was a teenager, oblivious that 20 or so of my family were buried there. The only burial I ever attended there was my maternal grandmother. Morris Hill is one of the older style cemeteries that actually has headstones instead of in the ground markers. 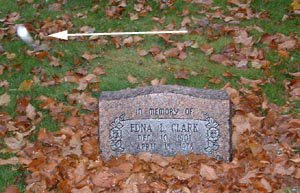 Newer cemeteries have restricted the old style markers in many areas because it is easier to mow the grass and maintain a cemetary without having to weedwhack around a traditional tombstone. The staffmember at the Morris Hill Cemetery was great. 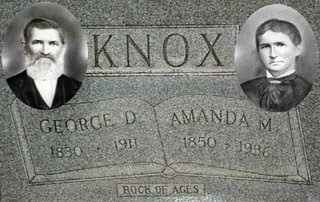 I figured I'd only try to find a few of my relatives so I asked about the oldest one buried at Morris Hill: George Dawson Knox. George was my maternal great, great, grandfather. He was born in 1830, moved to Iowa and fought in the Civil War on the Union side as a Iowa Volunteer. After the civil war, George married my great, great grandmother, Amanda Martha Knotts in 1870. She was 20 years younger than George, born in the Shenandoa Valley of Virginia in 1850. They eventually moved to Kansas and finally Boise in 1890. There may have been snow on George's roof, but there was fire in his furnace. 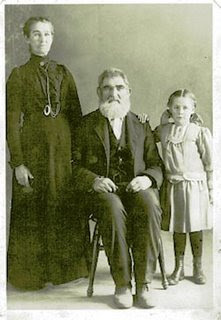 He fathered six children with Amanda, including my great grandmother, Ada Janette Knox. Ada was only 17 when she ran off and married Edgar Elsworth Bush (ten years her senior). She quickly gave birth to my grandmother, Edna Letha Bush. Tragically, Ada died two years later giving birth to a Edna's baby brother (he died at birth). My grandmother (pictured below with George and Amanda) was raised by her grandparents. I assumed that George, being a Civil War veteran, would be buried in the cemetery's "Silent Camp" dedicated to Civil War veterans. But after flipping through a huge book listing all of the cemetery residents, the cemetery worker said George wasn't buried there. Instead he was buried next to Amanda in the regular part of the cemetery on the edge of the Silent Camp. And my grandmother's grave was right next to them on the map. The Morris Hill employee circled the location on the map and told us to come back if we were having any trouble finding them (it is a 70-acre site after all). So Tess and I set off in the pouring rain somewhat skeptical that we'd be able to find them quickly. We pulled the car next to the Silent Camp and decided to just park there and start our search. But stepping out of the car, I discovered we'd stopped right next to their graves. Okay, I've always been skeptical of mystical "orbs" that spirit photographers point out in so called haunted houses. I wasn't taking these photos looking for spirits. I was just documenting my ancestors for my family tree. I have to admit, though, I found this kind of odd. First I stop our car right next to the graves in cemetery with thousands of graves. Then I snap digital photos that have these glitches that you can't blame on bad processing at the Walmart. I'll just chock it up to yet another strange, yet true episode of this mysterious journey we call life. I hate to tell you this, Tim, but after intense digital processing on our advanced state of the art equipment here at the NSA, we have concluded that those are nothing more than contrails from the miniature ICBM's that we were testing at that secret test facility that you just HAPPENED to walk into at the wrong moment. The groundskeeper, one of our employees, has been reassigned to a very cold and lonely place. Since you didn't actually SEE those hypersonic missles zip out of those silo's, just caught them on digital, it will be easy to discredit any attempts you might have to compromise national security, chalking it up to swamp gas or even ectoplasm, a theory our crackpot division would be more than happy to advance. 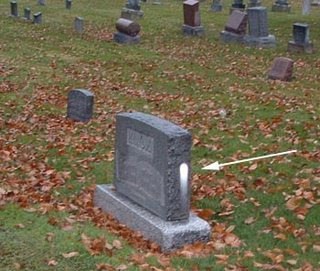 On a serious note, my wife, ever on the lookout for orbs, asked me why we never get any orbs in our photos of grave sites. I pointed out the connection you had to those graves, and that the orbs may just have been your ancestors thanking you for remembering them. Thanks for sharing, guy. Could you send me the original uncropped, unaltered and uncompressed images please? In what order were these photos taken? How many photos were taken in between these two? How much time elapsed between taking these two? Did you put away the camera, clean the lens or do anything else in that period which might have disturbed something stuck to the lens like a raindrop or lint? Flash or no flash? How hard was it raining? I'm not sure how you overlooked these, they are plain as day to me. If you examine the pictures closely you will also discover what appear to be white arrows pointing right at the spots. Don't know what they might indicate but they sure are creepy. I already ruled out the contrails from iniature ICBM's angle, but nice try. And I actually would like to believe that my grandmother and great, great grandparents appreciated my visit. R. I'm not ruling out rain, but I did take pains to protect the lens. Some were taken with a flash and some weren't. I didn't put the camera away, but I kept it inside my coat. I can send you the originals. I took several of my grandfather and uncle's graves in the military part of the cemetary and there weren't any orbs. You are right, the white arrows are very eerie. Kind of like the ones in the shot of the ghostly bunny at the lighthouse keeper's house. I hate the new breed of headstones... I love old graveyards. Even more than that... I absolutely love photoshop. Don't you? I agree, at least the old style headstones were an artform, obstacle for lawnmowers or not. And yes, I love Photoshop, but the photos are genuine (except for the arrows, don't tell Lights). Though my nephew thinks the orbs are rain induced.